Few studies have examined how changes in BMI [body mass index] over time associate with risk of adverse outcomes in children receiving renal replacement therapy [RRT]. The objective of this study was to examine the association between annualized changes in BMI and the risk of death in children treated with RRT. 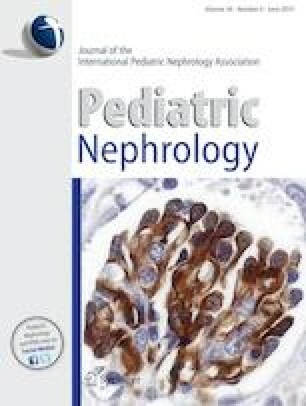 We performed a retrospective cohort study of 1182 pediatric dialysis and transplant patients in the Pediatric Growth and Development Special Study of the United States Renal Data System. Quintiles of annualized change in BMI z-score (with cutoffs of − 0.50, − 0.13, 0.09, 0.57) were used as the primary predictor, with the middle quintile (− 0.13 to 0.09) serving as the reference category. Cox models were used to examine the association between exposure and death, with time of analysis starting from the second BMI measurement. Median follow-up time to death or censoring was 6 years. Median age was 14.6 years, and 61% of children had a functional graft at cohort entry. There was a U-shaped association between BMI change and mortality risk: a large decline in annualized BMI z-score change (> − 0.50) was associated with an increased risk of death (adjusted hazard ratio [aHR] 1.54 (95% CI 1.17–2.03), p = 0.002). A large increase in annualized BMI z-score change (> 0.57) was also associated with an increased risk of death (aHR 1.44 (95% CI 1.07–1.92), p = 0.02). No interaction was noted between annualized BMI change and initial treatment modality (dialysis or transplant, p = 0.15). Maintenance of a stable BMI in pediatric patients receiving RRT may be associated with improved survival. The online version of this article ( https://doi.org/10.1007/s00467-019-04249-z) contains supplementary material, which is available to authorized users. The interpretation and reporting of the data presented here are the responsibility of the authors and in no way should be seen as an official policy or interpretation of the US government. Study design: EK; data acquisition and analysis: BG, EK, MR; Data interpretation: all authors; supervision and mentorship: EK. All authors contributed intellectual content during the writing or revision of the manuscript and accept accountability for the overall work by ensuring that questions pertaining to the accuracy or integrity of any portion of the work are appropriately investigated and resolved. Dr. Ku was funded by the National Kidney Foundation Satellite Dialysis Young Investigator.